During the holiday season, I find I am reflective. At that time of year there’s a tendency to think of ‘home’ and absent family. It can be a generational thing because you remember yourself as a child, the people around you at that time, when you look at your own children. Relatives long past, cluster in your mind. How times have changed? But the shadows of their underlying character would have adapted. What sounds pompous and stuffy, only disguises the message. The crisp exterior shell of people who lived in a different era merely hides the hardships, wars and heart ache the experienced. [An 'old school perspective' – to be read with a perfect BBC male accent of someone of advancing years] A monocle, pocket watch and cane may help visual learners. Now as we all know, people who claim to have low 'self esteem' are really just attention seeking whiners. However, there is modern school of thought that suggests that 'self image' may influence significant factors such as ultimate educational status and income bracket, or 'how they turn out in the end.' I know it's a bit racy, but there is a possibility that such psychobabble may have a kernel of common sense at the bottom of it. Whilst I wouldn't describe myself as right wing, I certainly think that if a pat on the back and a 'jolly good show!' would make a difference to the little blighters, then I'm all for it. Anything that would prevent them being a burden on the State would have my endosement. I'm not saying that I hold with 'empty praise,' mind you. I think even those autistic types would see through that. You would have to tailor your 'praise' better than that if you want it to stick, if you want it to make a difference, a positive difference. I know it's quite rash, this kind of 'positive thinking' kind of malarkey, but I don't think it would be too onerous or time consuming. I mean you wouldn't have to go all mad and gaga like the colonials do, no, no, no, don't overdo it, but the timely appropriate word, might make all the difference. You don't have to be all sloppy and sentimental about it. Perish the thought!…….. 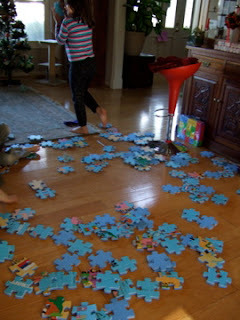 It is a very big puzzle afterall. Did I manage reciprocal? Does that qualify? It was almost appropriate! Well that was nearly timely, only a hint of hesitation on my part. “O.k. Deal! Ready?” Come on, speed up, pay attention woman! He marches over to his brother, hunkers down, places his nose three inches away from his sibling's face to tell him, “you are done a great job! I like it when you are dah helping bruvver.” Great specificity. Couldn’t have done it better myself. “Yur welcum!” Great reciprocity. Spot on my son! Posted on January 4th, 2007.